Blizzard Entertainment managed to make a name for itself with some hugely popular titles. Today, we’ll tackle one of its mightiest creations via a basic and introductive Hearthstone deck builder guide. It won’t be filled with tips and strategies that can turn you into a legendary master of the game. Rather, we will go through what we believe to be basic tips that can be applied both to beginners and long-time players. If this is your first time mingling with this game, you’d better arm yourself with a handful of patience. In the end, you might accept the fact that this game will probably consume your entire free time. However, this beauty is worth it! So, let’s delve in the following useful guide that will prepare you for a stunning game experience. Hearthstone Deck Builder: Why to Pursue this Path? That’s a good question: why? Why would you start building your own deck? Well, except for the fact that it will give you immense satisfaction given the fact that it’s the result of your own mind? Here are more reasons to own custom decks. If it’s your first time with Hearthstone, things will be confusing no matter what you do. But if you wish to climb the ladder as fast as possible, you have higher chances to do so by making a deck of your own. You will become more and more comfortable with it. Moreover, you will have an easier time maneuvering it for ulterior modifications. Pre-made decks will always give way to a major problem. They’re all highly subjective. Therefore, it’s not likely that you will easily stumble upon a deck that really molds to your personal play style. The chances are that you will end up switching things around anyway, personalizing it no matter what you do. Better start right off the bat with something that suits your style and gameplay. As if this game wasn’t difficult already, you need to be extra mindful of the preparation process before you get to the actual Hearthstone deck builder part. You need to visualize your deck’s victory conditions. Depending on how you want to achieve this win, you will need a personalized deck configuration. Make a deck that gives you control over the board and opportunities to destroy your opponent’s minions one by one. Decks that favor building up momentum and spontaneous bursts of damage that can help you shut down your opponent with one powerful move. A deck that will favor an approach involving swarming your enemy with small minions while constantly shutting down their own. Usually, players lose their minds whenever they see a powerful card. However, they might be in danger of overcrowding their deck with items that consume too much mana. As Hearthstone is mostly a strategy game, it is often times that deception, craftiness, and small steps can overthrow strength. Keeping your opponent in check with numerous minions is one way to ensure your victory. Nonetheless, the final style depends highly on your own gaming skills. Identify your core cards. These are the ones that you absolutely cannot go without. They are usually very compliant to the strategy you chose for your deck. These items will work as an extension of your main character the moment you enter the Hearthstone arena. For example, if you are going for an aggressive Rogue, you should consider choices such as Cold Blood or Leeroy Jenkins. Game creators designated 61 special cards for each of the nine classes, namely Rogue, Druid, Warlock, Warrior, Shaman, Priest, Mage, Paladin, and Hunter. However, collecting them all and gathering them together in one deck won’t do the trick. Only several of them can be mixed with other cards to obtain a certain style like a control or aggressive deck. Otherwise, you will just obtain an ambiguous series of cards with which you can’t build any specific strategy. Usually, professional include up to ten such special items in their decks. To round up your custom Hearthstone deck, you shouldn’t forget about minions. These cards can greatly help you throughout the game by taking some hits instead of your hero or doing some damage themselves. The selection process depends highly on the style you chose from the beginning. These minions too can boost the impact of your gaming strategy. For instance, if you are looking to win the game by an improved draw power, your first choices should be Azure Drakes and Loot Hoarders. First of all, you should make sure that your core and class-specific cards are the only suitable ones for your style and class. Afterward, you can complete your deck with minions until you hit the limit of 30 items. Do a lot of research outside the actual game. Nobody really expects you to be a natural at choosing the right cards. Sometimes, it can be difficult to make your choice without a lot to go by. This is why we recommend lurking around Twitch streamers or other live streaming platforms to observe other people’s strategies. You can analyze other people’s decks, but don’t try to copy them. Seek out inspiration instead. This research tip applies for any game you want to master. After you finish your custom pack, you should take it for a spin or two. The Hearthstone deck builder process is a highly experimental one, so don’t expect, by any means, to reap fruitful results from your first try. The only way to know for sure whether your attempts are working or not is to keep track of the scores. Find out what works against that one Mage configuration that you keep losing. Discover the best approaches to counter aggro (a deck built on aggressive mode). And don’t worry, you don’t need to keep a critical eye on every game and scribble everything down on a notebook. There are software tools that can help you there. 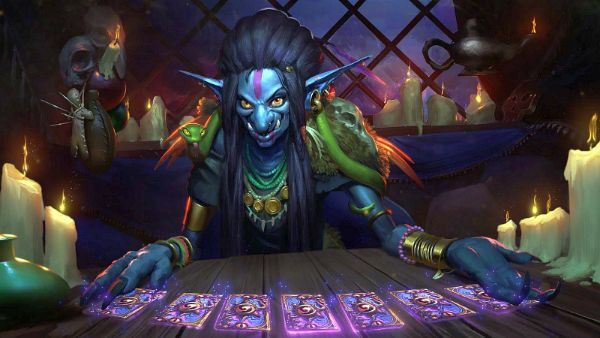 We can pluck out one valuable lesson after our Hearthstone deck builder guide: you need to arm yourself with patience. Another important thing is that you don’t necessarily have to reinvent the deck-building process. Information is out there, you just need to synthesize it to your own liking. Sometimes, all it takes is some inspiration and several tweaks to a traditional formula. Hearthstone continues to be one of the greatest names in e-sports and gaming tournaments. As such, it comes off as a given that it’s no easy feat to master it. There are as many deck-building possibilities as there are Hearthstone players. Now that you know the basics, it is your quest to find the right deck for you.